Tagline: KATYA - ROCK LIVES! 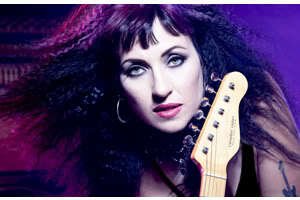 KATYA is a first generation, American-born, Russian Freedom Rocker. She is an amazing singer, songwriter, performer and musician with a repertoire of over 300 songs. KATYA is a cast member in the Mark Burnett Production Reality Television Series "ROCK AND ROLL FANTASY CAMP" on VH1 Classic. The show features Paul Stanley (KISS), Marky Ramone (RAMONES), Phil Collen (DEF LEPPARD), Mark Hudson, Duff Mckagan (GUNS N' ROSES) and Matt Sorum (GUNS N' ROSES). KATYA toured JAPAN. She performed at the HARD ROCK CAFE and KMC Music Conference in OSAKA. An international tour is being scheduled for her debut album, "ROCK LIVES!". Check for show dates at KATYAMUSIC.com. KATYA opened for QUEENSRYCHE. She has signed a distribution deal with Music One in the Philippines; also she was nominated for Female-Singer Songwriter of the year by the LA Music Awards. Her self-produced/written, debut album, "ROCK LIVES!" consists of internationally known guest stars: David Campbell, Stephen Perkins (Jane's Addiction), Gonzo Sandoval (Armored Saint), Jerry Peterson (Eric Clapton), Adam Cohen (Ray Charles) Paulo Gustavo (Graham Bonnet), John Philip Shenale (Tori Amos) and Eliza James (Burt Bacharach).